Alex Resnick is a guitarist and educator with over fifteen years of experience in the field of music. He holds a Bachelor of Music in Guitar Performance from Arizona State University and is currently pursuing a Master of Music in Guitar Performance at Arizona State University under the direction of Professor Frank Koonce. Before transferring to ASU, he studied classical guitar with Charles Hulihan at Glendale Community College. He has performed in several master classes with internationally acclaimed artists such as David Russell, Pavel Steidl, Scott Tennant, Roland Dyens, and Maximo Diego-Pujol. He has performed in several venues such as the Orpheum Theater (Phoenix, AZ), the Herberger Theater (Phoenix, AZ), the Tempe Center for the Arts (Tempe, AZ), the Kerr Cultural Center (Scottsdale, AZ), and the Grand Canyon University stadium (Phoenix, AZ), as well as performing as a guest artist for both the Verve Dance Company, and the National Society of Arts and Letters. As a guest of the Grand Canyon Guitar Society, he has performed as the opening act for artists such as Roland Dyens, Maximo Diego-Pujol, and Celso Machado. 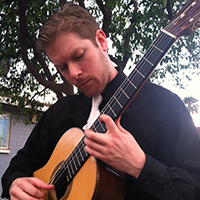 As a member of the GCC Guitar Octet, he has performed the world premieres of Mark Houghton’s “Frippertron” and Rex Willis’ “Eighteen and Forty Nine,” at the 2014 Guitar Foundation of America convention in California State University’s Meng Concert Hall.